Sheila Hicks: 50 Years at the Institute of Contemporary Art Philadelphia does successfully what many retrospective exhibitions aim to do: it shows both the breadth and consistency of an artistic career that, in this case, covers half a century of creative output. 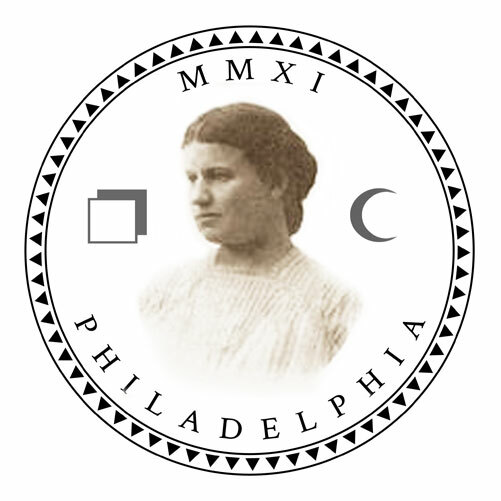 Yet, despite wide-ranging themes and a few big leaps in technique and scale in Hicks’ early career, the through-line of color, verticality, and materiality repeats with a message and a product that verges on branding. Radical shifts in scale—from the enormous, entwined showstoppers May I Have This Dance? (2002-3)and Les Escargots (2003-4) to the diminutive woven wall pieces that Hicks calls “minimes”—enliven and fill the exhibition hall but cannot conceal a formal dependency that might have been alleviated if the show simply had fewer pieces. 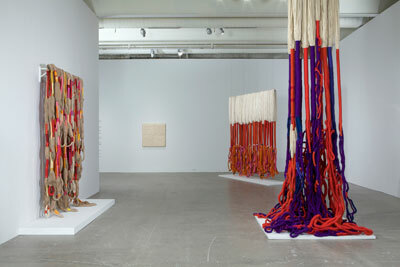 Hicks is at her best when she works on a majestic scale and sends fibers flying to dizzying heights in the ICA space. A group of large-scale sculptures made with linen, rayon, cotton, and other fibers that have been woven into threads and ropes and wrapped onto tubes, coiled into balls, or looped into fist-sized tassels comprise half of the exhibition. The tree-like Bamian (Banyan) (1968/2001) and Trapèze de Cristobal (1971), two of the most striking pieces, harness the heady emotion of vertical shapes and forms. The former levitates, its gnarled roots wrapped in orange, purple, and green hovering inches from the floor; the latter shoots straight up to touch the soaring ceiling, with its roots pooling in a tangle on the ground. Though slender in form, the color of the fibers and the coiling technique used to gather threads into trunk-like tubes give the sense of an indomitable vibrancy emanating from a tough core. Working in fibers, Hicks has long drawn on the politics and status of the groups most connected to weaving—women and indigenous peoples—and her titles court these associations: The Principal Wife (1968); Tenancingo (1960), a reference to a Mexican state known for its weaving; Banisteriopsis (1965-6), a medicinal vine used by Amazonian natives. Strong and supple, the large-scale pieces get their strength from countless tiny pieces joined together, rather than from slabs of steel or concrete—a political statement if ever there was one, both in the art world and beyond. Three pieces arranged on a low platform—The Evolving Tapestry: He/She (1967-8), Banisteriopsis (1965-6), and Banisteriopsis - Dark Ink (1968-94)—are made up of hanks of linen and silk piled like sandbags and call to mind wartime and disaster. Shaggy-haired Menhir (1998-2004) is not much to look at (and may recall a certain character from The Addams Family). The title refers to standing stones erected by men in prehistoric Europe, possibly to commemorate battles and heroes; in this context, the long, feminine, grey-brown hair pointedly asserts its ageing womanhood. The serious themes and associations of many of the large-scale works bring with them a darkness and pensiveness, a thoughtful dimension to their bright colors and giddy scale. background, Menhir), Institute of Contemporary Art, University of Pennsylvania. 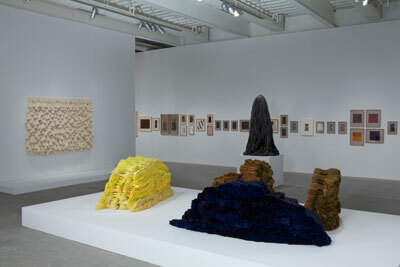 For all of their power—and taken in the context of male-dominated minimalist and post-minimalist sculpture, their voice as an alternative is considerable—the assertion of Hicks’ work breaks down with the last mounted pieces, such as Etiquette (2009), which incorporates dip-dyed price tags of the sort found on hankies and rings in antique shops, and Triumph (2010), into which is woven tufts of human hair. It is with these pieces that the work swings from feminist to merely feminine, with these newest pieces—dealing as they do in tropes of “women’s art”—seeming the most dated of the lot.